The ScanPro scanners are the micrographic equipment of choice in the world’s most prestigious libraries and corporations. The latest product release, the ScanPro All-In-One™ microfilm scanner, continues this tradition. It is the only compact desktop scanner in the micrographics industry that is both an easy to use on-demand reader-printer-scanner for all microfilm types as well as a high speed conversion scanner for microfilm and microfiche. The All-In-One scanner is fast, it is accurate and it is affordable. Check out all of the ScanPro microfilm scanners below. At Stars Information Solutions we are committed to bringing our customers the latest technologies to make working with microfilm easy, efficient and fun! The ScanPro® i9300 microfilm scanner is the product you’ve been waiting for to bring your image-marked, or blipped, film into the digital age. We know that original blipped film scanners are aging and you have limited options for repairing them. That’s where the i9300 comes in — it can capture ALL of your blipped film, regardless of brand — single level, two level and three level. The ScanPro® 3000 26 megapixel camera1 is the only camera in the micrographic industry to utilize pixel-shifting technology to provide the best image producing microfilm scanner on the market with the clearest image. The ScanPro 3000 high performance 26 MP camera1 captures clean, crisp images that make research and look-ups fast and easy. These clean, crisp images even improve the speed and accuracy of OCR. The development of cutting-edge pixel-shifting technology continues to grow and expand in the marketplace. Today, well known, highly respected, market leading camera manufacturers like Canon, Nikon, Sony, Olympus, Panasonic, Leica, Zeiss, Pentax, Lumix and more are using pixel-shifting technology to leverage the camera sensor to capture higher megapixel images. And, this pixel-shifting technology is also moving to other camera applications and industries like studio photography, medical research, machine vision, astronomy, and microscopy to increase the true resolution of imaging devices. 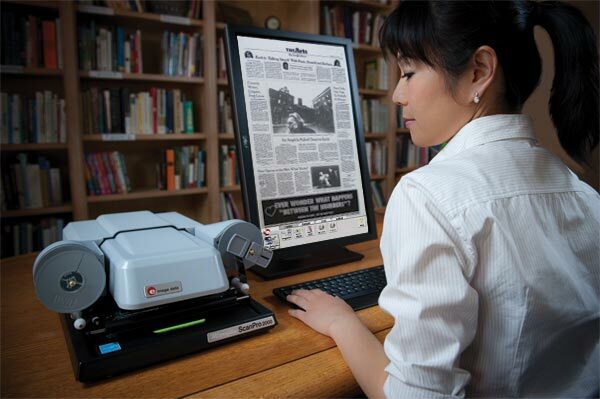 We’re moving microfiche into the digital age with our newest innovation, the AUTO-CarrierTM. Prior to the AUTO-Carrier, microfiche research required users to manually move the fiche carrier to find their desired image. This process has long been known to be cumbersome and quite frustrating. The AUTO-Carrier eliminates all the manual work making research easy, efficient and hassle-free! With patented pending technology, the AUTO-Carrier eliminates the manual work of moving the fiche carrier to find your desired image. The AUTO-Carrier is operated entirely using on-screen controls to perform all operations, allowing users to move directly through their fiche, image-by-image anywhere on the fiche, with just a single click. In addition, the AUTO-Carrier can automatically scan a range of images or the entire fiche, seamlessly and with unparalleled accuracy. And, at speeds up to 100 images per minute! Never before seen in the micrographics industry, the ScanPro AUTO-Carrier eliminates the manual work of moving the fiche carrier to find your desired image. The ScanPro AUTO-Carrier is operated entirely using on-screen controls to perform all operations, allowing users to move directly through their fiche, image-by-image anywhere on the fiche, with a single click. In addition, the ScanPro AUTO-Carrier can automatically scan a range of images or the entire fiche, seamlessly and with unparalleled accuracy and speed. At e-ImageData and Stars Information Solutions, we pride ourselves on providing the best, most innovative technology available in the micrographics industry and we are proud to introduce the ScanPro All-In-OneTM microfilm scanner. The All-In-One scanner is the first, truly universal on-demand, conversion unit on the market today. It provides users with all the necessary tools to make research more efficient and more productive than ever before. With the All-In-One scanner, you get all the capabilities of your current ScanPro model plus more, bringing you a complete digital solution. The All-In-One is available with any current ScanPro model and is paired our newest innovation, the AUTO-Carrier™(AC) – that automatically scans microfiche. The AUTO-Carrier (AC) is operated entirely by on-screen controls. This allows users to move directly through fiche image-by-image, anywhere on the fiche, with a single click. In addition, the AC can automatically scan a range of images, groups of images or the entire fiche, seamlessly and with unparalleled accuracy, at scanning speeds up to 100 images per minute with AUTO-Scan® Pro — the optional high-speed scanning software. In addition to its fiche-scanning capability, the All-In-One also offers a roll film carrier, making the All-In-One scanner the only desktop scanning solution for all film types. For questions and pricing for any of the ScanPro models, please contact us or call (210) 490-9156. 1The ScanPro 3000 high performance, pixel-shifting camera produces the clearest image in the microfilm industry. Pixel-shifting is a state-of-the-art technology being used by some of the best known and respected manufactures in the camera industry like Canon, Nikon, Sony, Olympus, Panasonic, Leica, Zeiss, Pentax, Lumix and many others. Although e-ImageData is not the first manufacturer to use pixel-shifting, we are the first and the only manufacturer in the micrographics industry to use this advanced technology to capture higher megapixel images. Using pixel shifting, e-ImageData starts with its largest image sensor in the industry (10.5mm x 7.328mm, 3.5µm 2 pixel, 6.6 megapixel sensor) to capture and integrate 4 unique optical images into a single 26 megapixel camera image, the clearest image in the industry.